Moist and fabulously fluffy this delicious chocolate cake is quick and easy to make and guaranteed to delight. Grab your apron and mixing bowl and fire up your oven to 180°C (160°C for fan assisted ovens)/Gas Mark 4. For cupcakes bake in a fan assisted oven at 160°C. It's baking time! 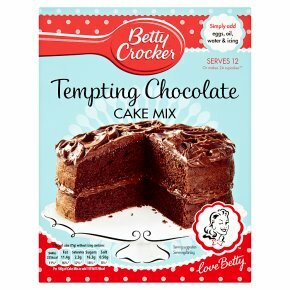 Preparation 10 mins Baking time 23-28 mins Serves 12 All you need is: 125ml vegetable oil (8 tbsp + 1 tsp) 230ml water 3 medium free range eggs 1 tub of Betty Crocker? Tempting Chocolate Icing 2 x 8" well-greased cake tins (or 2 x regular size muffin trays & cupcake cases) Only 3 steps to cake heaven... 1 Mix the eggs, oil, water and cake mix gently together and whisk (by hand or electric mixer) for 2-3 minutes until smooth and creamy. 2 Pour the cake mixture evenly into your two greased cake tins. For cupcakes pour mix evenly into the cupcake cases**. 3 Bake in the centre of the oven for 23-28 minutes or until a rounded knife inserted into centre of the cake comes out clean. For cupcakes bake both trays together for 18-22 minutes**. Then cool on a wire rack. Sandwich your cakes together and cover with lashings of Betty Crocker? Tempting Chocolate Icing. Enjoy a slice of this tasty chocolate cake, perfect for any occasion or just a treat! **For full cupcake recipe suggestion please see www.bettycrocker.co.uk Bake it yours Add chocolate chips to your cake mix to create a double chocolate cake...delicious!